Act fast! Today is the day to give the Keep Marching book for Mother's Day at a special low price. If you still need to get gifts for the moms in your life, don't worry — we've got you covered. You have TODAY to give the new Keep Marching book to a mom you love (including yourself!) for Mother's Day — and for today ONLY we were able to cut the price down to $15 (from $25) for a special Mother's Day deal. 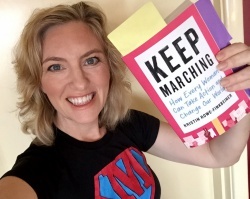 The KEEP MARCHING book landed in bookstores just last week and it's getting great reviews — "a perfect primer," "a powerful call to action," "a must-read for new activists." *Order today, get a special low price, and choose a beautiful (or funny) e-card to announce your gift! No need to run to the store! Giving this book for Mother's Day is actually a double gift: 100% of the proceeds from the sale of the KEEP MARCHING book support the life-changing work of MomsRising. It's a win-win. Inside the pages you'll find tips and tactics for creating change, as well as the stories, facts, and the policies we need to break through, including on: fair pay, gun safety, ending sexual assault and mass incarceration, addressing wealth inequality and building the safety net, immigration, as well as paid family/medical leave, childcare, healthcare, and more. We think it's the best last-minute Mother's Day gift on the planet — but you must order NOW to get the special low price deal! 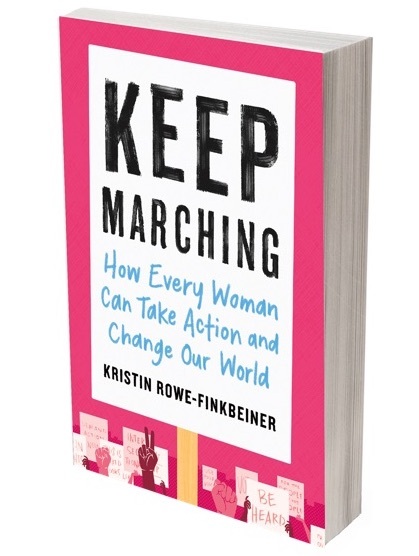 "KEEP MARCHING, by the fierce and fearless Kristin Rowe-Finkbeiner, is a perfect primer for women everywhere who want to take action - whether you're heading to your first town hall meeting or running for office. With wit and clarity, she covers everything from reproductive rights to maternal mortality to mass incarceration, including a powerful and much-needed call to action for white women to step up and do our part in the fight for justice. Keep Marching is not only a how-to manual; it's a celebration of women's power, progress, and potential to change the world." "Within every woman lies the power to spark a movement, and KEEP MARCHING provides each of us with the tools and the inspiration we need to unleash our full potential. This extraordinary book can teach an entire generation of women—from every background— how to organize, mobilize, and catalyze a 21st century revolution for true equality." "KEEP MARCHING is a powerful call to action for women everywhere—whether you're a seasoned organizer or someone who's getting involved for the first time. As Kristin [states], 'women can lift our nation.' Practical and inspirational guides like this will help us make it happen." "KEEP MARCHING is the book we all need to remind us why the fight against white supremacy and patriarchy will actually set us free. Kristin's enthusiasm jumps through the pages. We are all lucky to have a book like this during this painful moment in America." "Wanna change the world? Read this book. Because in fearless, fierce and clear prose, Kristin Rowe-Finkbeiner has written the necessary, intersectional guide we need today. With kindness, wisdom and thoughtful solidarity, Kristin provides the blueprint for first time activists to seasoned organizers who want to work together to create a more equitable nation." Hurry! Only days left to give the Keep Marching book for Mother's Day. Need a last-minute Mother's Day gift? Give the new Keep Marching book! 100% of proceeds support the life-changing work of MomsRising. We'll mail your gift and you can announce it immediately with a beautiful e-card of your choice. Know what I want for Mother's Day? Chocolate, flowers, and ... a fully activated, empowered, growing, vibrant women's movement to take back our nation. But this isn't just a dream. We have you covered in the Mother's Day gift department: You can give chocolate AND social change. Give the new Keep Marching book to a mom you love for Mother's Day, and 100% of proceeds will support MomsRising — the movement that fights every day for women, moms, and families. The Keep Marching book is all about building a robust leaderFULL movement to take back our country — and women who've read it are loving it! "I had never marched for a cause in my life until the Women's March. So great to have a book that gives facts, figures, strategies, tactics, and stories that will help me shape my action plan for enacting change moving forward. This will be my Mother's Day present to every badA$$ woman I know." "This book was so inspiring and insightful ... There are a ton of books out there about politics that re-hash debates from the past. This book looks to the future and is a practical guide on how we can all create a better future together. I'll be buying a copy for my mom and four sisters for sure!" (See more reviews in the p.s. below). Keep Marching is the book we need for these times, and the perfect Mother's Day gift for all the badass women in your life. In other words, Keep Marching pushes us all forward even as some leaders pull our nation backwards. Order today and choose a beautiful (or funny) e-card to announce your gift! 100% of the proceeds from the sale of the Keep Marching book support the life-changing work of MomsRising — so it's a double gift. It's a win-win. And, paired with chocolate, it's irresistible and unforgettable. Sign a public THANK YOU to all the women who are rising and who keep marching, resisting, and persisting for change! I know you're busy. So I appreciate you taking a quick moment for this today. Here's the fast lowdown: My new book, Keep Marching, comes out TODAY in stores across the nation. It celebrates and grows our power together. And 100% of author proceeds go to MomsRising. It's time to celebrate us. It's time to applaud our power together. It's time to lift other women. * Can you now take a moment out of your busy schedules to sign a public THANK YOU to all the women who are rising and who keep marching, resisting, and persisting for change? When you sign on, your thank you will be seen by leaders at all levels from household to U.S. House who are lifting other women. Why? Because after you sign on, we'll share the signatures on a webpage so each and every member of MomsRising knows they aren't alone and that we're building a movement where everyone can rise. We're even thinking of taking out some newspaper ads to show how very strong we are together as we help remind us all to vote and celebrate our power together. What's in the book anyway? Inside the pages of Keep Marching you'll find a celebration of our power together, along with the stories, facts, wins, and policy priorities of women across our nation, including: fair pay, gun safety, ending sexual assault and mass incarceration, addressing wealth inequality and building the safety net, immigration, as well as paid family/medical leave, childcare, healthcare, and more. (In other words, it's a proactive policy agenda pushing toward positive change). At the end of each chapter are actionable tips for making change in local communities across our nation that the reader can pick up and use right away to move legislation, votes, and candidates forward. It's our time to keep marching, to keep applauding and thanking one another, to lift each other.